On Sunday afternoon, my darling Ad Nauseam won Grand Prix Charlotte. Hours later, David’s Merfolk won Grand Prix Los Angeles. Although neither of us could make it to those tournaments, it’s exciting to see our babies graduating to the Grand Prix spotlight they’ve long deserved, although at least David already got to enjoy it last year at Copenhagen. It’s even more exciting to see how healthy Modern has become. I was already optimistic about format diversity going into Grand Prix Weekend, and both Charlotte’s and Los Angeles’s Day 2 breakdowns should satisfy even Modern’s harshest skeptics. Their respective Top 32s continue that story, whether Charlotte’s mix of Jund and Jeskai, or Los Angeles’s Affinity resurgence and its 13-year-old ringleader. Thanks to the dual Grand Prix, Modern has never been in a better place going into a summer season. Especially if we get more coverage streams to do timeshifted matches. We’re two weeks away from the pending May metagame update, and all that delicious Grand Prix data will heavily influence our format picture. You can expect to see the Day 2 and Top 16 numbers folded into our format-wide breakdown then (they are already accounted for in our Top Decks spreadsheet! ), but for today, we’re going to unpack event-specific takeaways from the Grand Prix. Just yesterday, David promised he’d leave the quantitative analysis to me, and rather than make a liar out of our resident Lord of Atlantis, I’ll be sifting through the different Grand Prix stats today. Our job is to both describe the Grand Prix field and also to assess a few claims about different metagame trends and strategies arising from those tournaments. There will be ample Modern discussion in the coming weeks, and this article will help you stay grounded in the hard evidence and not just off to the hype races. In the aftermath of Grand Prix Weekend, most authors and players agreed Modern was as diverse as it could be. As numerous commentators and writers observed, it truly is a “play what you know” format. Data from both Grand Prix confirms this assertion, showcasing numerous viable decks spread across Tier 1 and Tier 2 with no clear frontrunners. Below, you can review all the Grand Prix decks with above-average Day 2 prevalence (4+ showings). Although there are interesting performers among decks with three or fewer appearances, their n is just too small to draw meaningful conclusions. For each of those 4+ showing strategies, I give its pooled Day 2 share along with its aggregated shares in the Top 32, Top 16, and Top 8. This gives a general description of how different decks made up different segments of the weekend metagame. Instead of analyzing Charlotte and Los Angeles as distinct events, I’m merging all their Day 2 and Top X data to get combined shares. This lets us talk about broader Grand Prix themes without getting too bogged down in regional and event differences. It also helps us smooth over some tournament peculiarities like the Charlotte pairing disaster or different East vs. West Coast metagames. Finally, it reflects the general understanding of the Weekend, where players and pros are more likely to discuss the Grand Prix holistically and not just as standalone scenes. This Grand Prix retrospective is almost identical to our pre-Grand Prix portrait from last week. Sure, the order is a little off, but the top eight Grand Prix decks are a perfect match to our current eight Tier 1 exemplars. The remaining seven are all in last week’s Tier 2 selection, again in a slightly different order. This should be deeply encouraging for Nexus readers who put faith in our metagame numbers: we’re doing something right if our pre-Grand Prix tierings align so neatly with the post-Grand Prix Day 2 breakdowns. Let’s take this a level deeper. As many tiering critics object, popularity and performance probably don’t have a causal relationship (although there’s definitely a correlation). This makes it hard to translate Day 2 standings, or even Top 8 standings, into a performance metric: maybe a deck just shows up in the Top 8 because it had the most pilots. Conversion rates are an effective way to separate a deck’s actual strength from how many players are running it. By seeing what percentage of Day 2 decks actually made it to Top 32/16/8, we get a better sense of deck’s relative performance, not just how many of them bullied their way to the top through sheer numbers. The table below calculates those Day 2-to-Top X conversion rates for each of the top Grand Prix decks. In addition, I also add an “adjusted conversion score” metric that accounts for all three conversion rates and the deck’s initial prevalence. A higher conversion score means a relatively better performance at the Grand Prix. Lower numbers mean a worse performance. If you want the math behind the score, check the spoiler box below. If your brain is already aching, just remember that bigger scores are better scores and enjoy the table. We start calculating our conversion score by ranking all the conversion percentages within each category (highest, second highest, etc.). Next, we subtract those rankings from the total number of decks (n=16), and then sum all three of the resulting scores: each deck gets one ranking score from Top 32, Top 16, and Top 8. We end by taking that sum and multiplying it by the deck’s total Day 2 share. For example, Jund had the seventh-best Top 32 ranking, the best Top 16 ranking, and the second-best Top 8 ranking. That equals a sum of 38 points, or (16-7) plus (16-1) plus (16-2). Finally, multiply the sum of 38 by Jund’s Day 2 share, 8%, to get a final conversion score of 3. This method gives equal weighting to conversions in all three brackets and does so at an ordinal level. It’s much better than eyeballing the conversion scores to try and figure out whether one deck’s Day 2-to-Top 32 rate of 50% was better than another deck’s Day 2-to-Top 8 rate of 15%. We also express this sum as a function of deck share to represent the greater/lesser confidence that comes with a larger/smaller sample of decks. That is, we can be more certain that a deck with a higher n corresponds to its conversion score, whereas a deck with a lower n may not actually boast that ranking. Smaller n decks can still get a high score, however, if their sum was high to begin with. Scapeshift, for example, had awesome conversion numbers but only a 5% Day 2 share. This gives it a respectable, but not commanding, 1.7 on our scale. Conversion rates are important metagame analysis tools, so expect us to keep sharpening this method as the year progresses! Jund and Affinity were the highest performers all weekend. Even though neither deck took home gold, and despite some metagame positioning troubles for both strategies, these two decks had the best overall combination of prevalence and conversion rates. After Jund and Affinity, many of the other Tier 1 decks fell right in the same viability bracket with very close conversion scores. This includes Scapeshift (at the top with 1.7), Infect, Jeskai Control, and Abzan Company (at the bottom with 1.4). Although these decks didn’t perform quite as admirably as Jund and Affinity, they put up strong numbers all weekend and should still be considered major Tier 1 players. Note Abzan Company’s solid but relatively unremarkable performance, another area where measured heads prevailed over unfounded hype. Burn was a clear under-performer at the Grand Prix. Despite having an acceptable 7% Day 2 prevalence, Burn could only manage a middling 35.7% conversion to Top 32, and an abysmal 0% and 0% for Top 16 and Top 8 respectively. Its low conversion score reflects all of these shortcomings. RG Tron is a weird case. On the one hand, Joe Lossett made the Los Angeles Top 8 with his Lightning Bolt build of Tron. On the other hand, outside of Lossett’s isolated performance, the deck did relatively poorly, occupying only 6% of Day 2 to begin with before underperforming in both the Top 32 and Top 16. Given the high degree of anti-Tron technology we saw in sideboards, I’d read Tron’s low score as reflecting a prepared metagame and not a weak deck. Merfolk and Eldrazi were the best Tier 2 decks in the bunch (sorry, Ad Nauseam), with Merfolk winning out both quantitatively in its conversion score and qualitatively in taking down Los Angeles. I’m not really sure how Merfolk navigated the Affinity wave en route to its commanding Grand Prix performances, but both tribal strategies have major potential coming off the events. Analytic side note: Merfolk were totally absent from Charlotte, which is one nuance the pooled statistics miss. Taken as a whole, all of these numbers and accounts confirm Modern’s unparalleled diversity. It’s true that this openness comes with costs, especially for players who worry about sideboard slots and the matchup lottery to begin with. That said, if it means Modern stays a “play what you know” format going into June, I’ll take those costs and try and pick up percentage points off knowledge and experience alone. There’s a widespread myth in my online and paper Modern circles that the BGx kingpin is poorly positioned in open metagames. Underlying this argument is a history of post-Deathrite Shaman Jund never winning a Grand Prix, its weaknesses to rising ramp stars like RG Tron and Eldrazi, and its reliance on perfect sideboard structure to target a metagame. Even selecting the wrong flex cards (e.g. Kalitas, Traitor of Ghet vs. Huntmaster of the Fells) can be disastrous. Grand Prix Weekend showcased a Jund cohort that either got very lucky or made some excellent metagame calls. I’m leaning heavily towards the latter, based on its consistently top-notch quantitative performances. Despite being only the fourth most played deck in the aggregated Day 2, Jund sent the most players to the combined Top 16 and Top 8 at five and three respectively. This represented the best overall Day 2-to-Top 16 conversion rate of any deck at 31%. Its Day 2-to-Top 8 conversion was behind only small-n Kiki Chord at 18.8%. Furthermore, Jund’s raw Day 2 share at 8% also suggests the deck’s overall success, even if we lack the Day 1 data to know if Jund had a decent conversion rate going into Sunday. Looking at our earlier conversion score table, we also see Jund had by far the best overall ranking. At 3 points, Jund sits a few notches above silver-medalist Affinity (2.6) and almost doubles the score of the runner-ups (Scapeshift’s 1.7, Infect’s 1.6, and Merfolk’s and Jeskai Control’s 1.5). This suggests Jund was almost twice as viable as these other decks at the Grand Prix. Further cementing its status, Jund was already the most played Modern deck going into the Grand Prix at 8.7%, and it has only gained ground since then. As of today, Bob and Goyf have secured a 9.2% metagame share as compared to second-place RG Tron at 6.5%. To be clear, none of this means Jund is the best deck in Modern. Our sample is far too limited to suggest a format-wide best strategy, and qualitative experience with Jund suggests major holes which certain metagames can exploit. For example, both Tron and Jeskai Nahiri take advantage of notorious Jund gaps to steal matches from the BGx goodstuff pile. That said, the Grand Prix sample and our Day 2/Top 32 analyses give us more than enough data to bury the ridiculous assertion that Jund is poorly positioned or somehow struggling. Junding ’em out has rarely been better. I did it again! I bet against Affinity! Despite my January resolution to never again sell Affinity short, I did just that in last week’s Grand Prix breakdown article: “Unless you’re a Frank Karsten master of Affinity, stay away.” Sure enough, guess what happened. Affinity got 2nd at Los Angeles, and was the first and second most played Day 2 deck at Charlotte and L.A. respectively. It also sent the second most pilots to the Top 8 of any deck (Affinity at two copies vs. Jund at three), and had the second most players in the aggregated Top 16 (Affinity’s four to Jund’s five). Adding insult to injury, even my own metrics betrayed me, with Affinity finishing at #2 behind only Jund in the conversion scores. So much for Affinity being poorly positioned. Where the heck did I go wrong? Other than betting against Affinity in the first place, my major error was in misevaluating pre-Grand Prix data. In the leadup to May 21, Affinity was objectively struggling, occupying a measly 4.6% of the format the Wednesday before Los Angeles and Charlotte. Making matters worse, this represented a -1.2% dip from its April level at 5.8%, a downward pre-trend suggesting a metagame hostile to Team Ravager. Add in Jeskai’s rise, the persistence of Jund’s Bolts, Commands, and Grudges, and a sustained uptick in Abzan Company and Kiki Chord, and Affinity was facing a dismal picture going into the Grand Prix. Fortunately for Affinity, and unfortunately for my advice, this dismal picture didn’t apply at the Grand Prix level. Affinity is an archetypal “Game 1 deck,” a strategy favored before sideboarding and then facing an uphill battle in Games 2 and 3. The larger a tournament, the sharper this edge: Modern Grand Prix are legendarily diverse, which means heaps of Tier 2 and Tier 3 prey for Ravagers to gobble down on Day 1. Day 2 gets rougher, but the deck is typically strong enough to scrape at least 1-2 copies into Top 8. Its conversion score, second-best after only Jund, is a testament to this staying power even in a narrowed field. Many look to Games 2 and 3 for Affinity’s Achilles Heel, but these hopes can be misplaced. As we saw all weekend, hyper-consistent Affinity can persevere through all but the most oppressive combination of targeted hate (Stony Silence) and general interaction (Bolts and Electrolyzes). Opponent missed their Silence or Grudge draw? Affinity surely didn’t miss its lighting fast start, and it has two games to capitalize on a failure to find sideboard bullets. It gets even worse when players shave anti-artifact answers to begin with, whether because they misread the metagame or they traded Terminates for Dreadbores to prepare for Nahiri. All of this led to Affinity Strikes Back from Saturday through Sunday, and forced me to amend my resolution: never bet against Affinity at the Grand Prix level. There will certainly be smaller regional and local events where Affinity is a bust. This even applies to the larger SCG Opens, as we saw plainly at Milwaukee and Indianapolis. If you’re battling in those environments, feel free to bet against Affinity all you want, at least if the metagame context justifies it. But at a Grand Prix? No way. Affinity just picks up too many percentage points from too many angles. There were two Jeskai hype-trains heading into Grand Prix Weekend, and Nahiri, the Harbinger was conducting both. The first was the more critical and measured hype-train I sold both last week and in my April metagame breakdown, where I asserted a blue-based deck would hit Tier 1 and where I expected Nahiri would lead that charge. This train rumbled along the tracks all weekend long straight into Tier 1 station. Unfortunately, we had another locomotive running on a parallel track. This was the hype-train of $50 Nahiri speculators, a Tier 0 Jeskai deck, and an unusual spat of ban mania where noteworthy authors predicted Nahiri’s banning before the end of 2016. That one careened straight off the rails, but just because the Hyperbole Express crashed and burned, that doesn’t mean Jeskai Control didn’t finish chugging into top-tier central. If you were on the first train, the more realistic and nuanced one, Jeskai performed exactly as expected. It had the third highest Day 2 share across both Grand Prix, barely missed the Los Angeles Top 8 by a literal .0018 on tiebreakers, and boasted a respectable conversion score on par with other format bigshots like Scapeshift, Infect, Merfolk, and Abzan Company. It even surpassed Tier 1 regulars Burn and RG Tron in those metrics! Its Top 32 and Top 16 shares were no Affinity or Jund, but Jeskai Control managed to tie or beat almost every other deck over the weekend, taking up 10% of the Top 32 and 8% of the Top 16. Zooming out from the Grand Prix, Jeskai is riding a promising pre-trend from 3.8% in the April update to 4.5% before the Grand Prix. It’s up to 4.8% today. Given how recently Nahiri burst onto the competitive scene (Pete Ingram’s May 14th win at SCG Indy), it’s surprising that anyone thinks Nahiri is under-performing. The sword-wielding Kor has only been summoning Emrakuls for two weeks and we’re already seeing the deck put up these numbers! That’s a heartening performance for blue mages everywhere, especially when you realize that some Jeskai decks in the Top 32 eschewed Nahiri altogether and still did well. Of course, if you were on the 3:10 to Hype(rbole) like many Modern players and pundits, then Jeskai didn’t live up to your groundless expectations. That says nothing about Jeskai and everything about making realistic metagame predictions. It should come as no surprise that Jeskai didn’t break the format or immediately surpass Jund, Affinity, Tron, and all the other Modern big-dogs. Upward mobility takes time—even Eldrazi took a few weeks to ruin Modern! Jeskai Nahiri is no Eldrazi, but the deck has more than enough datapoints to suggest its longevity. Expect to see this strategy stay a solid Tier 1 contender for months to come. I didn’t get to watch Andreas Ganz make Modern history with his Ad Nauseam triumph, but I did get to see craziness like Bubble Hulk vs. GW Hatebears and UB Mill (you’re my hero, Jinlin Li) vs. a no-Emrakul RG Tron. Mind Funeral for twenty never looked so good. Besides, it was probably for the best that we didn’t have to endure the Grand Prix Charlotte software mishaps and tiebreaker foibles. Even the heavily-moderated Twitch chat would have devolved into DOTA 2 territory in a hurry. Whether you got to take in Los Angeles from your comfy chair or had to suffer through Charlotte’s long lines, you still got to enjoy either dynamic and diverse Modern gameplay or high-quality coverage. Plus we all get to reap the rewards for the rest of the summer. We won’t get more Modern Grand Prix until late August, but we have plenty of metagame information to digest until then. We also get to revel in Eternal Masters previews before playing the pack lottery for virtual $150 bills. Let’s also not forget upcoming Eldritch Moon spoilers shortly thereafter. I’m not sure what I’m looking forward to more: learning about the invisible entity behind Innistrad’s madness or Modern getting Innocent Blood with new Lily-themed art. Or go old-school Odyssey and keep the zombie mob. Either way, please, Wizards? Thanks for reading and digging through the Grand Prix aftermath with me! Let me know in the comments if you have any questions about different decks, any of the stats presented today, deck positioning, or where Modern is heading next. Also, if you have any tales from Grand Prix weekend and want to write them up for Nexus, check out the Volunteer Contributor program to share your experience! Happy to hear you enjoyed it! Fun one to put together. Thank you for the article! Im sure you shouldnt read too much in the conversation rates for example because there were 260 players in LA that went at least 7-2. So the top100 can be a very random cutoff without knowing the decks of the lets say next 50 players (which also have very reasonable tiebreakers). Additionally you dont know which decks were 8-1 or better in day one which obviously influences the conversation rate. Similar problem with the “random” cutoff top32 etc. There are always data limitations, but we work with what we have. I would have been much more nervous about the data if it gave us a picture that was radically different from the pre-GP metagame. That might suggest the Top 100 cutoff wasn’t very representative. Instead, it lines up relatively nicely with the pre-GP data, while also giving us some new datapoints to challenge our earlier understanding. That combination of factors means we can definitely draw limited conclusions from the data. Besides, we already know people are going to draw conclusions from this data regardless of those limitations. I’d rather at least unpack those conclusions as much as possible instead of just sticking with a surface understanding of GP shares alone. Great analysis, as always! Modern definitely seems to be in a solid place right now where multiple strategies are competitive and no one archetype is overly dominating. I’m also always excited to see Merfolk do well, especially against Affinity (even if it would have been cool for 13-year old to win a GP). You mentioned that Affinity thrives in the kind of open Metagame you tend to see in a GP. I’m curious, do you think metagames you tend to see in an SCG Open or even a local mid-level event (say 30-60 people) tend to be less open or more predictable? Speaking personally, aside from going to an FNM, where I literally know what more than half of the field will be, I have a lot of difficulty predicting what I’ll face in any mid-level event. Once a field hits 30 people or so it usually feels pretty diverse, or failing that, kind of random, but I’m wondering if you or anyone else has noticed local trends. I too am very happy about where Modern is. Format has rarely looked better. In my experience, local metagames are a bit more predictable than larger ones. I use the Japanese circuit as an example of this, where certain players tend to bring the exact same strategies from week to week, or have a backup deck they occasionally sling, depending on the field. There’s variation depending on the field, and you’re always going to have the untiered, random brews, but I find smaller scenes to be more predictable as a whole. Thanks for the article, Sheridan. Good stuff as always. It’s interesting to see that Eldrazi still converted at a pretty respectable rate (to be honest, I’m pretty impressed with the Bant list that made Top 8 – solid, solid deck). I’m also a bit surprised to see Scapeshift in the Top 5 in terms of conversion rate. Any word on what the splits are between Bring to Light vs. Temur? And are we any closer to a consensus successful build? I’m also glad that you’ve set the record straight with regards to Jeskai’s accomplishments in the metagame. While I agreed with David that Nahiri was a tad overhyped by some, I think his piece swung too far in the other direction in terms of criticism. The results show that Jeskai was a deck very much in contention yesterday, even more so than its Grixis cousin that actually made Top 8 (shout-out to Patrick Chapin and his sweet list, though – any Grixis deck that can take matches from Valakut and RG Tron can’t be bad). I think it will be a contender in updates to come. As for how Merfolk navigated the Affinity-infested waters… as Simon Slutsky showed us, Hurkyl’s Recall cures a lot of ills, and most of the successful Merfolk lists were packing 4. Running Vapor Snag and Harbinger of the Tides also helps. Essentially, if you tempo the heck out of them, you have a chance. You won’t be miraculously favored, but you have enough juice to win the match if your Affinity opponent stumbles and you draw the right pieces. I haven’t been tracking the BTL vs. Temur difference in the spreadsheet, and I realize I should be. Good project for the future and I’ll start noting it from this point onward. Yeah, there were a lot of misconceptions and hype (in both directions) around that deck. Overall, I’m comfortable classifying it as a viable Tier 1 strategy along with all the other Tier 1 options. Grixis, however, remains solidly Tier 2, although I’m hoping it gets a bit more attention after Chapin’s run. The weird thing is Slutsky didn’t run Harbinger at all, and only had a single Snag. Lee, 13th at GP LA, did have 4 Harbinger but had ZERO Recall’s in the board. At least Slutsky’s board, with 2 Gut Shot and 4 Recall’s, makes sense there, but it’s still an anomaly to me. Congrats to Merfolk but I’d be curious to see more explanations about how this happened. I think that I’ll appeal to Occam’s Razor here and just say that Simon was running hot, and that he timed his Hurkyl’s superbly. If you’re expecting Affinity in your playgroup (as I am), you end up with a rather different 75 than the one he piloted to victory. Not to take anything away from his accomplishment – if anything, the fact that he mostly had postboard hate makes his victory even more impressive. Valerion Lee not having Recalls is almost difficult for me to comprehend – you NEED them to hang against Affinity, and it’s almost unfathomable to not run into them at least once in a big event like a GP. They also put in work against some Tier 3 decks such as U-Tron and Lantern Control, particularly the latter. This was a mammoth article, but I was sucked in from the start and read every word. Thanks for the excellent breakdown. Point of interest; there’s some direct conflict between your article and its immediate neighbor on nexus. The other author makes a rather heavy-handed point about Nahiri being rubbish and how he was right to doubt the hype, going so far as to say that people who bought into playsets of the card must be feeling really bad. Upon reading this, it immediately rang false in my mind, and I was refreshed to see your more quantitative summary, highlighting the jeskai deck with Nahiri as a new strong contender, well worth looking at. Is modern nexus a wild movable feast between authors when it comes to analysis, or do you tend to need to present a unified front? Anyway thanks for the article. Always pleased to see scapeshift doing well, and hearing it from your excellent breakdown is even sweeter. So much to talk about, so little space! Need to work on getting these down to the 1,600-2,000 word range, but all the juicy narratives make it hard. There’s some variation between authors and their opinions, and everyone is free to disagree. That said, I always wanted authors to be referring to Top Decks statistics and staying in dialogue with those numbers, and I believe Jason has approached this the same way. In the future, especially given the differences between today’s article and yesterday’s, I expect to see more careful oversight of how that gets presented. Disagreement is okay but all opinions need to get supported. Amazing article. Seemed a more fair analysis on both Merfolk and UWR Control. I play both decks and didn’t review my experience on the analysis of the previous article. Personally I always play Harbinger and combine it with Hurkyl’s Recall to beat the odds against Affinity. It pleases me to see the deck taking the top place in such a big event. As for UWR, I’ve always struggled to find a fast and efficient threat that would help me not going to time (it’s one of the main reasons I don’t play it in every tournament). Nahiri seems to fix this. She can find answers faster, and hopefully can also end the game faster than before. I imagine that once we have potentially cleared the board with removal and Emrakul is attacking most decks will have a hard time recovering from annihilator 6. Merfolk’s finish is great. I wonder if we see more people pick it up, especially now that we know its Affinity matchup might be more manageable than many believed. Nahiri is definitely the real deal. It’s tempting to oversell her (best walker in Modern, ban in 6 months, etc.) and undersell her (over-hyped, tier 2 material, etc. ), but as long as you tow a middle line, it’s easy to see how she’s a solid Tier 1 staple. Is UWr’s success really because of Nahiri or is it because more people picked up the deck? I feel like the deck has always been good. It has won Worlds, a PT a GP and still we were told it was unplayable after Abzan dominated the PT 1,5 years ago. That remained a fact for no good reason even though Abzan mostly disappeared. 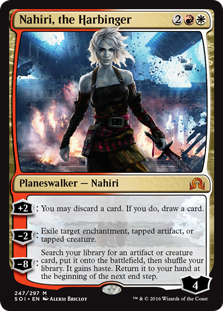 I don’t much care for how it’s success is mostly attributed to Nahiri when it’s the 55 other cards that are, and has always been doing the work. I’m not saying that you’re doing that but every article on the deck seems more interested on hyping Nahiri than analyzing the deck in general. That semi-finals game against Affinity where he ultied Nahiri with Emrakul in his hand and won anyway pretty much says it all. Nvm that wasn’t in the semi-finals, but in the win ‘n in? Anyway, my point stands!